This means that, as a Phantasy Star Universe veteran to boot, I have every right to keep my snarker rifle aimed at Segac. 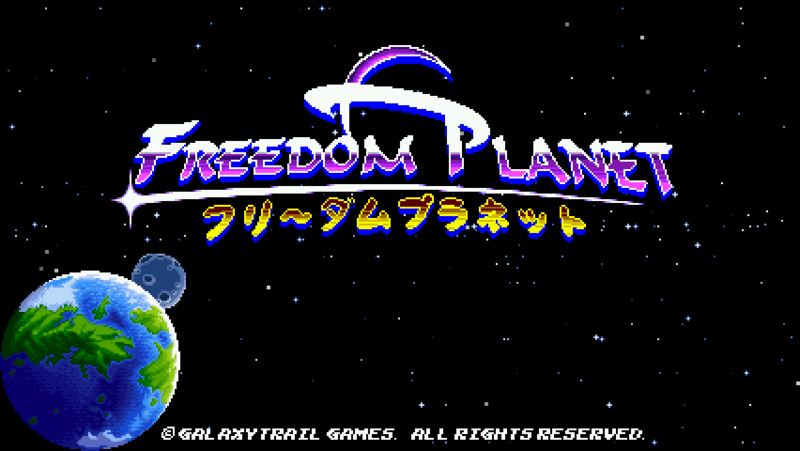 It’s actually not named after Planet Freedom from that Sonic the Hedgehog OVA. For that matter, since the release of the first demo, the game has made deliberate effort to distance itself from Sonic and be more of its own thing. One of the ways it hasn’t done that though is by having physics that work significantly better than Sonic 4’s. In earlier releases, rolling back and forth in a half-pipe allowed you to gain speed with each pass, just like how Sonic games used to. 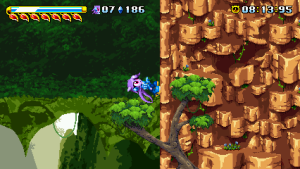 The removal of this feature confuses and saddens me, even though it is not as essential in Freedom Planet. More on that later though, as my relationship with the Sonic series is frustrated enough as-is. 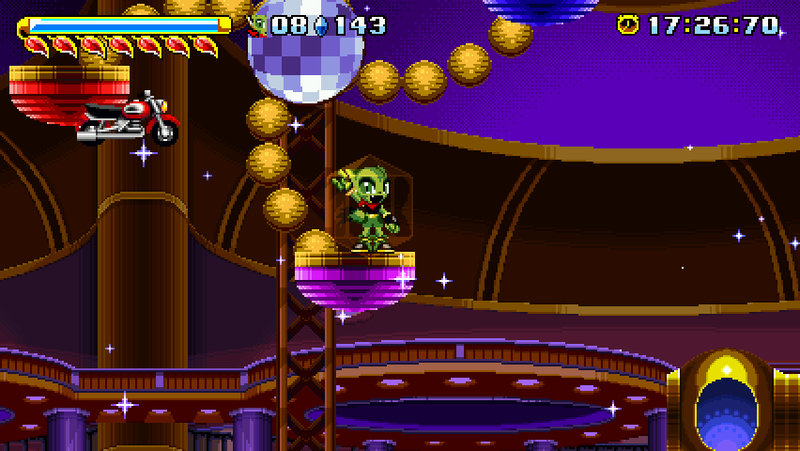 Fortunately the rest of Freedom Planet is good, very good, and doesn’t fail to cheer me up. Let’s start with the characters. 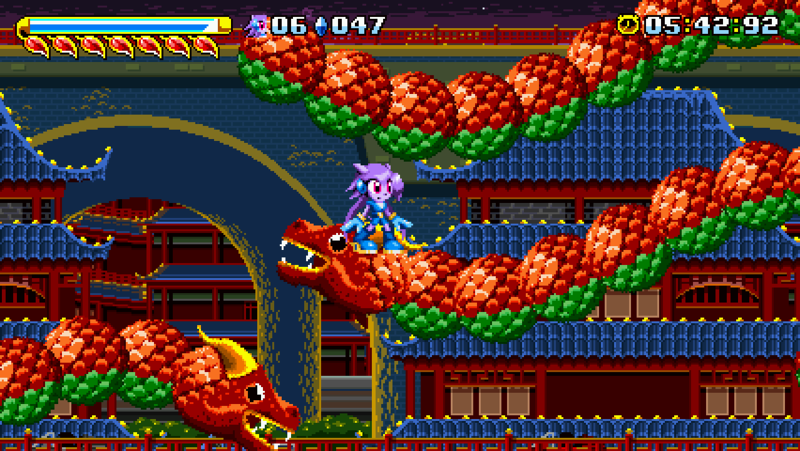 Sash Lilac the Dragon – The “Sega” character. 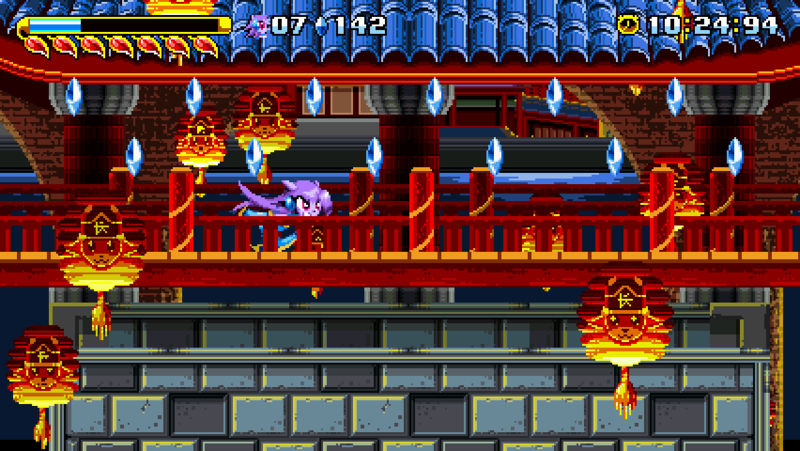 In the first demo, she was a purple hedgehog, but then she was altered into a dragon girl. She’s the fastest character and one of the most powerful attackers, even though she only has a pair of sharp hair braids. With them, she can whip enemies, perform a rising slash, and twist into a razor cyclone. 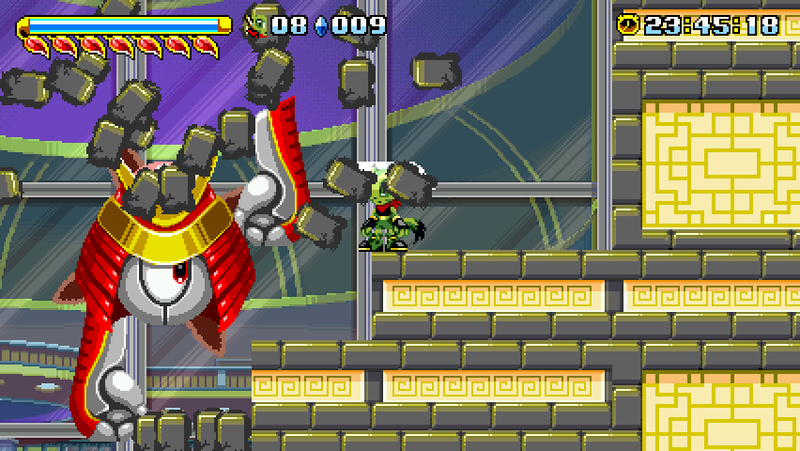 She may have lost Sonic’s spin attack as she’s grown up, but she retains Pulseman’s Volteccer, wherein she takes all of her energy and uses it to blast off as a damaging comet that ricochets off walls. This move also follows the contours of the landscape when executed on the ground and is great for launching off of ramps. Her cyclone allows her to double jump in the air, and on the ground it can be performed repeatedly as long as you hold down on the control pad and have energy in your meter to spare. It does not help you build up speed on slopes, but it allows you to preserve the momentum you’ve gathered without being vulnerable to attack, so long as you hold a direction while performing it. 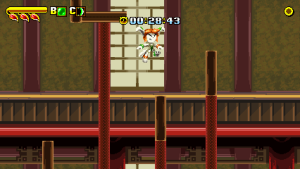 Carol Tea the Wildcat – The “Capcom” character. Carol’s attack animations are faster, meaning they have fewer frames and hence do less damage. She does have a few strong attacks though, like a pounce slash, a lightning kick, and the ability to roll. 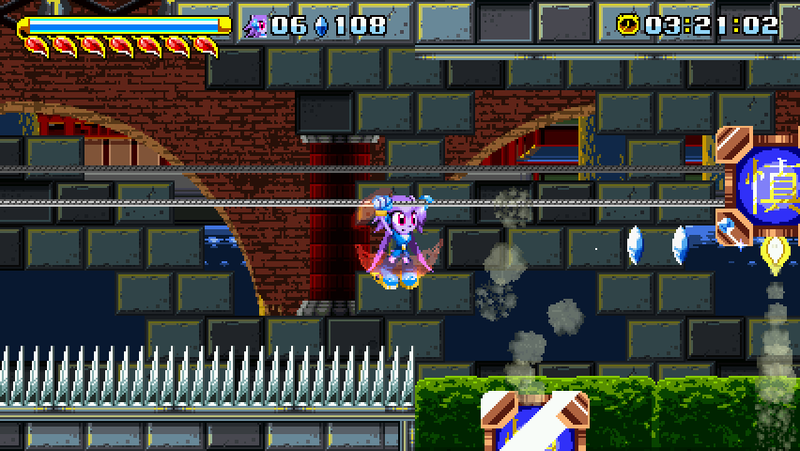 She can also scale walls similar to Mega Man X, though she’s a lot slipperier on them than X ever was, and she can use jump pads in the levels to take fancy shortcuts. She’s also a bike ninja; the amount of tricks and stunts she can do with her motorbike include an exhaust-powered double jump, a powerful nitro boost, sticking to and driving straight up vertical walls, carrying the darn thing across clotheslines, and just plain running over every hostile creature in her way. 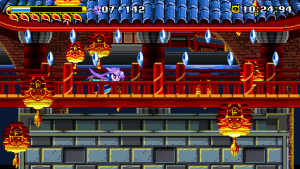 Pretty much all her attacks require her to get right in the enemy’s face, making her trickier to use than Lilac. 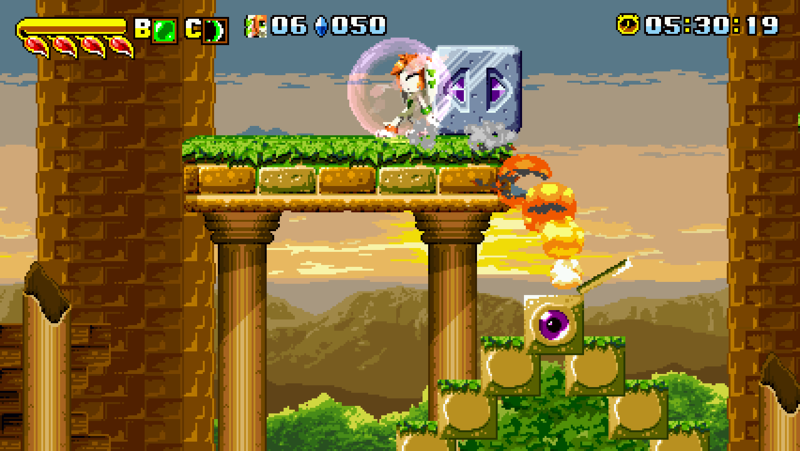 Milla Basset the Hound – The “Nintendo” character. The only barefoot character and the only one to run on all fours, but she’s the least speed focused so far. She’s supposed to be a basset hound, and like all basset hounds, she can project energy barriers and create blocks out of thin air. 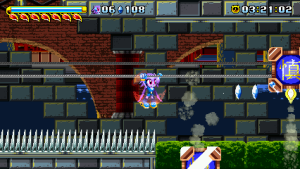 If she uses one of her blocks as a barrier, she can fire a powerful shotgun blast with it as well. She can also just lob her blocks at enemies, and in fact can pick up all the bomb and power-up crystals and pods in the game for use as projectile attacks too. This makes her more of a strategic character. She can run and dodge with the best of them, but you might have better luck blocking and countering with her instead, especially since she has only about half the durability of Lilac and Carol. 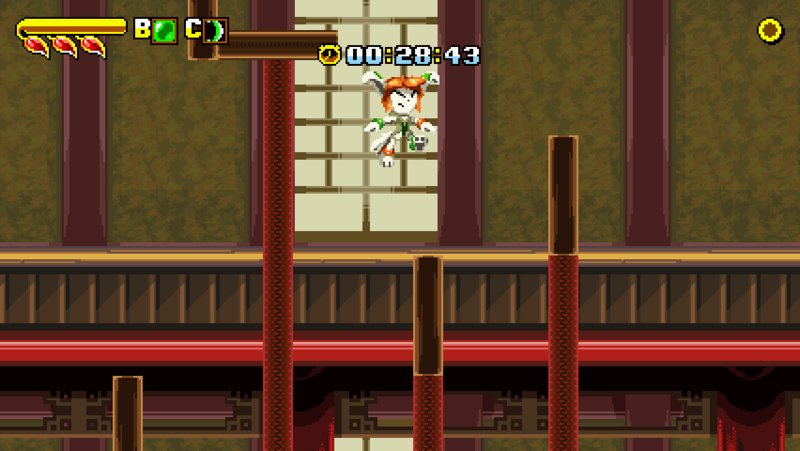 She also has a flutter jump like what Yoshi and Klonoa can do, only hers gets her FAR more distance. Rounding out her skills is the ability to dig in soft earth for treasure, which so far seems more of a novelty than anything. Spade the Cavy – Lilac’s rival for reasons that have yet to be explained, as he’s unimplemented in the game at this time. His play style seems like it will involve playing card projectiles and perhaps a means of getting past those water stream walls in Aqua Tunnel. 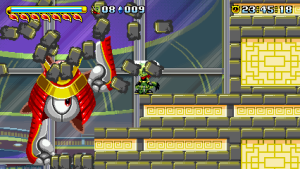 Commander Torque the Shellduck – Recently he seems to have lost the “duck” part of him. I have no idea what he is anymore, really. I wouldn’t be surprised if he becomes a coelacanth in the next demo since his character is still kinda up in the air, no thanks to his being not yet implemented in the game either. It looks like his play style may involve engineering, collecting, and swapping the game’s five types of shields. 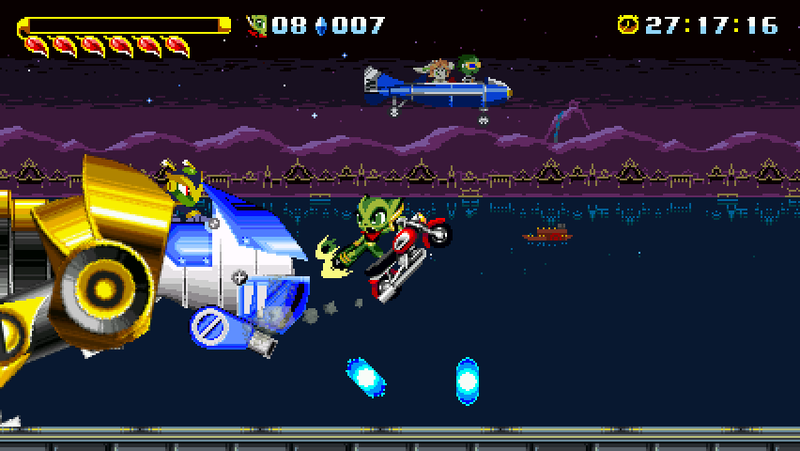 Freedom Planet bills itself as a cross between Sonic the Hedgehog (the momentum-based gameplay and shields), Mega Man (ladders, projectiles, and some of the platforming and level choices), and Gunstar Heroes (some of the boss designs). That’s fairly ambitious, but not unusual in today’s remix culture, and since all three of those games have been disappointing or lying fallow lately anyway, the time is ripe for a developer like Galaxy Trail to salvage their best parts and build something new from them. It definitely borrows more from Sonic than anything else, though it doesn’t play anywhere near as fast as any Sonic game. There are no spin dashes or super peel-outs to get yourself going in a hurry, but there are still steep slopes, ramps, loops, curvy highways, and even two kinds of springs to help propel you everywhere you need to go. 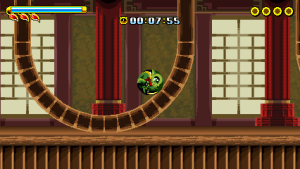 Every character is also surprisingly adept at just plain walking up vertical walls, provided there’s a quarter pipe leading up them. The lack of dash moves is not necessarily a bad thing though. 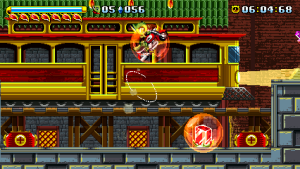 When the Sonic franchise started gaining more playable characters, the games’ emphasis on speed practically forced them all to be the same except for a unique move or two. Sonic 2’s spin dash was just so essential to the formula that EVERY character had to have it, and in the end, there wasn’t much room for diversity among all the playable characters. 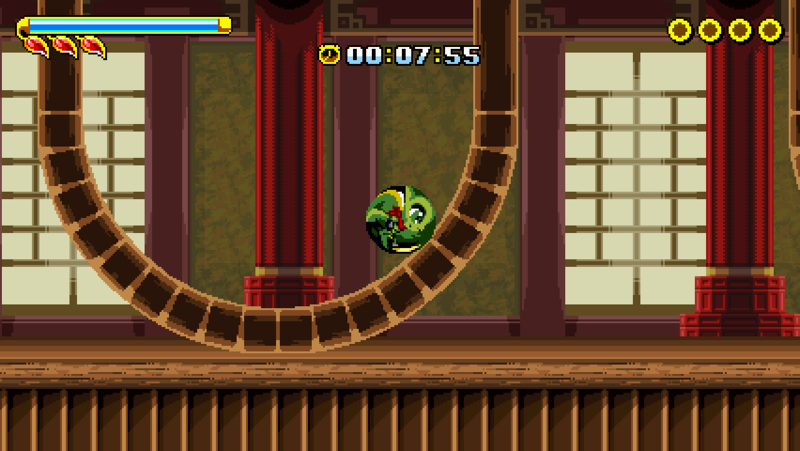 This came to a head in Knuckles Chaotix, which featured four Sonic clones and a bumblebee that broke the game by swinging said clones around like wrecking balls. 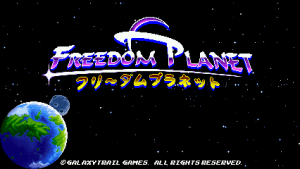 Freedom Planet isn’t as harried as Sonic though. It has many of Sonic’s tropes, but moves at a leisurely pace with them. This gives it more freedom to experiment with and expertly accommodate the very unique play styles among its characters. Part of me wishes that there was a bigger focus on building up enough momentum to sling yourself off that one ramp in just the right way so you can fly to that platform that looks impossible to reach, but I suspect the game is actually perfect the way it is. You can even PUSH BLOCKS! And you can kill things by dropping blocks on them! I know that shouldn’t sound exciting, but the game really does offer you lots to do. One way the game could stand to be more Sonic-like though is in its jump physics. Instead of being Mario or Sonic-like where you have inertia you have to fight against in midair, the jump physics are Mega Man-like, meaning that you can freely change direction in midair no matter how far you’re into your jump. This doesn’t really work though because of the game’s focus on momentum. The characters accelerate easily, making them a tad floaty when they jump, and without inertia stopping them from changing direction mid-jump, what you end up doing is zig-zagging back and forth when you’re trying to make precise landings. That’s bad enough, but the characters are also prone to slipping off ledges even after they land. This means that it’ll probably be really easy to miss or overshoot jumps in the game’s final stages, leading to cheap hits and deaths. Any stage with narrow platforms is something of a horror to navigate. 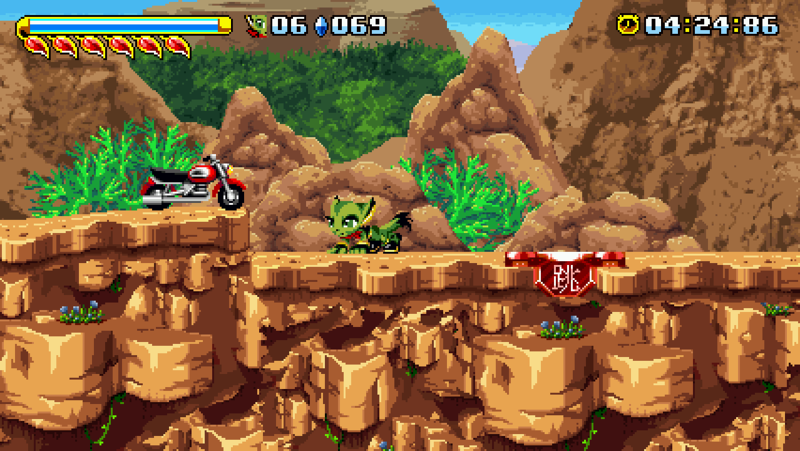 Thankfully the bonus level pictured here is just that and isn’t even mean enough to suspend you over spikes or lava. So far the game makes up for this with its level design. 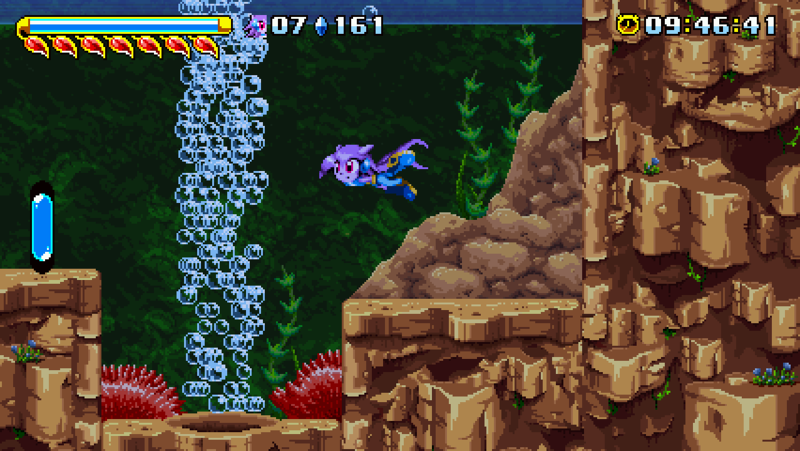 All the platforms in the main game tend to be large and hard to miss, and the stages are actually pretty friendly to players throwing themselves around willy-nilly. There isn’t even collision damage attached to the enemies unless they have obvious spikes or are actively trying to attack you, which is something I’d like to see more often in modern games. It’s all wonderfully designed so far, but I retain some concern that the endgame will be an exercise in controller-snapping frustration and it won’t be due to any lack of skill on my part. 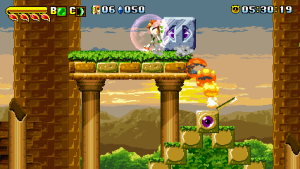 The remainder of the Sonic influence lies in its power-ups. Helpful items often show up as colorful crystals that you can shatter like video monitors to gain their bonuses. Most of these are shields that come in five flavors: Sakura, Heat, Crystal, Aqua, and Electric. 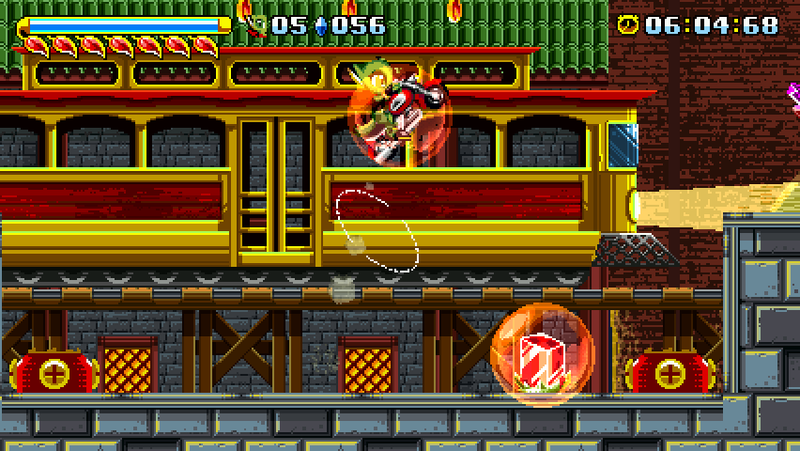 There are also small shield orbs you can get from chests, mechanical enemies, roulettes, and other things. In the first demos, collecting five of them gave you a shield determined by which orbs you had collected, but as of the latest demo they do nothing, which I hope changes soon. There’s also a rainbow crystal that grants invincibility, and there used to be a speed-up crystal that made you faster and gave you infinite energy for a short time. There was a power-up here. It’s gone now. Can Detective Carol figure out where it went if she examines the scene of the mystery? This is where the Sonic influence peters out. Most characters (Milla excluded so far) have a power meter that slowly refills over time and is used to fuel certain moves. 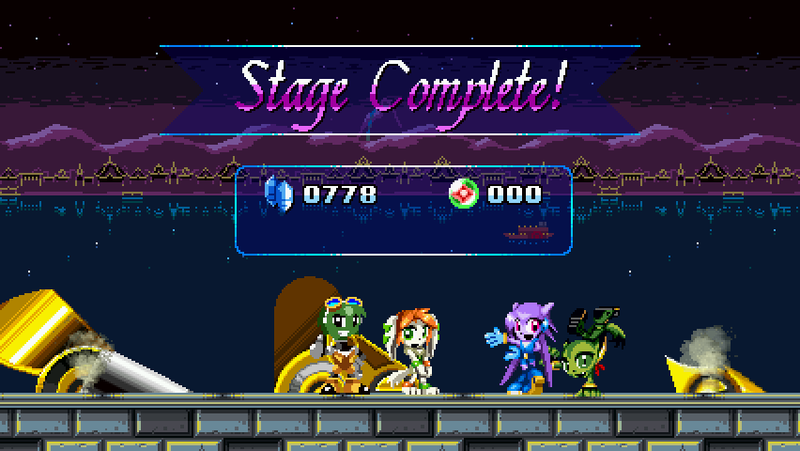 Lilac needs about a fourth of her meter to execute her cyclone attack and needs a full meter for her comet dash, while Carol needs at least a sliver of hers to perform her lightning kick and a full meter to use a nitro boost on her bike. Collecting blue crystals scattered throughout the levels refills the meter faster and collecting 200 of them gets you an extra life. 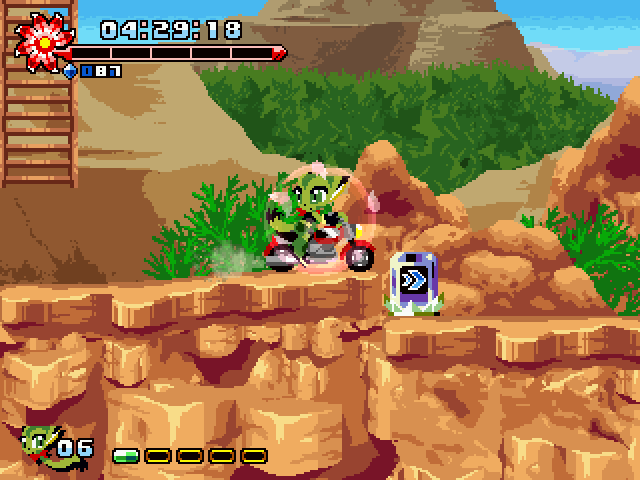 Note that every enemy in the game can collect crystals as well; you’ll need to defeat them to get back the treasure they steal. If the crystal thief is some invincible automation though, well… you’re just plain out of luck, my friend. Try not to be too OCD. Crystals are not your hit points either; those are represented by the flower petals you see on your HUD and find scattered in the levels, either individually or in large bulbs. Every character, even the weaker Milla, can take a decent amount of punishment because each full petal represents 2 hit points, and when they’re all gone, your power meter flashes to indicate that the next hit you take will be your last. The last time I saw that feature was in Megaman Legends 1 and 2, so you may be able to attribute its inclusion here to more healthy Mega Man influence. This is counter-balanced though by the game featuring next to no mercy invincibility, which, now that I think about it, is probably why collision damage is virtually non-existent in the game. Enemies that pack a lot of heat (like Serpentine) can shave off half of your life meter by juggling you with their attacks, so it’s a REALLY good thing that they can’t also hurt you by merely bumping into you. 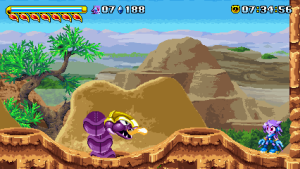 Notice how Serpentine, one of the main villains, wears a gold cap similar to the one on the giant purple serpent that serves as the game’s first boss. Could there be a connection here? You didn’t kill Serpentine’s mommy in the first level, did you, you heartless monster? The graphics have also been significantly improved over the various releases, but I honestly didn’t notice them at first. What stood out to me even more than the graphics was the sound. The music is beautifully orchestrated, such that I am really glad I contributed $25 to the Kickstarter. I want the soundtrack when this game releases and I want it BADLY. 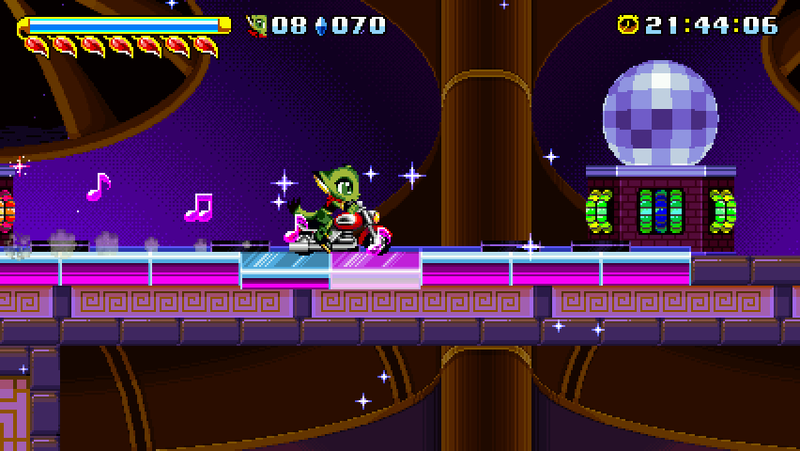 A quality soundtrack, like Freedom Planet’s, chooses instruments that evoke the feel of the levels you’re in and combine to create something that feels greater than the sum of its parts, with no single instrument overpowering the rest. The sound effects have also been improved over time, sounding richer and more original. The graphics? Well, as I said, I didn’t really notice the improvements at first. I thought the game looked fine when the first demo was released, and I still think it looks fine with its latest release. The shift has been from a bright, almost pastel-like style to a more detailed art style with plenty of additional color, but it took me a while to notice that Carol the Wildcat actually has whiskers now, and even then, that was kinda nice and cute more than anything. Dragon Valley still looked like Dragon Valley though; a desert-like first level that descends into a hidden rain forest. It also has bubbles. LOT of bubbles! SO MANY BUBBLES YOU—wait, isn’t this actually a glitch? 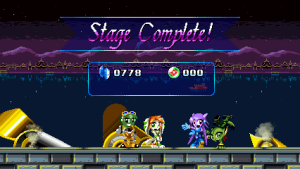 Won’t the game eventually crash from trying to render all those sprites? The second level, Relic Maze, looks similarly nice. It looks like how you’d expect an ancient labyrinth to look, and I suppose I ought to give the artists credit for the intricacy in the runes and the crystal mines it contains. It wasn’t until the third level though that I came to appreciate the richness of the art direction. 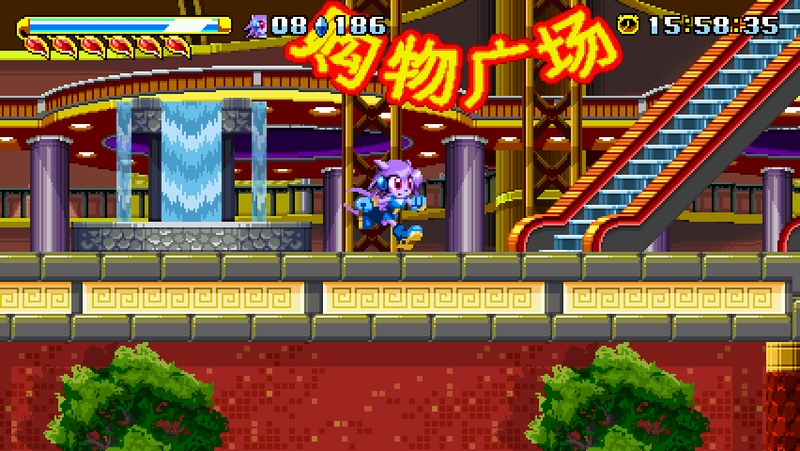 Fortune Night could be considered an allegory to the various casino levels in the Sonic series, but such a comparison would be woefully lazy. This is a gorgeous level from beginning to end, and it really makes you notice and appreciate all the effort that’s gone into the art direction. You have twisting Chinese dragons you can stand on! There are traffic lights that attack you! There’s a traveling trolley in the background! Intricate fireworks go off as you run through the place! 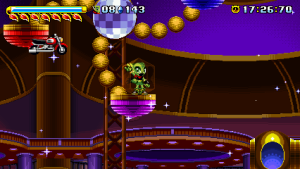 There’s a swarm of lanterns toward the end of the level that is accompanied by dancing spotlights, and that’s all BEFORE you get to the shopping mall! Inside there you’ll find fountains, escalators, prize balls that show off the game engine’s sprite rotation abilities, and disco balls that will make your characters want to dance! There are even restrooms you can enter and get kicked out of if you’re the wrong gender! 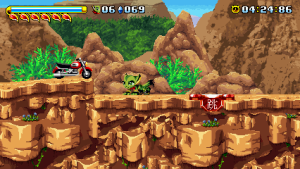 To top it all off, the stage ends with a ferocious battle against a giant cougar mecha, which is where the game gets to really show off how it uses its Gunstar Heroes influence. This is how you show off a game’s graphical prowess. You don’t just make something that looks nice and hang it up in the levels so that maybe the player will notice it as they pass by. No, you go farther than that and incorporate that art into the game itself. You make it interactable. You use the power of the game engine and the prowess of the programmers to make your art come alive. 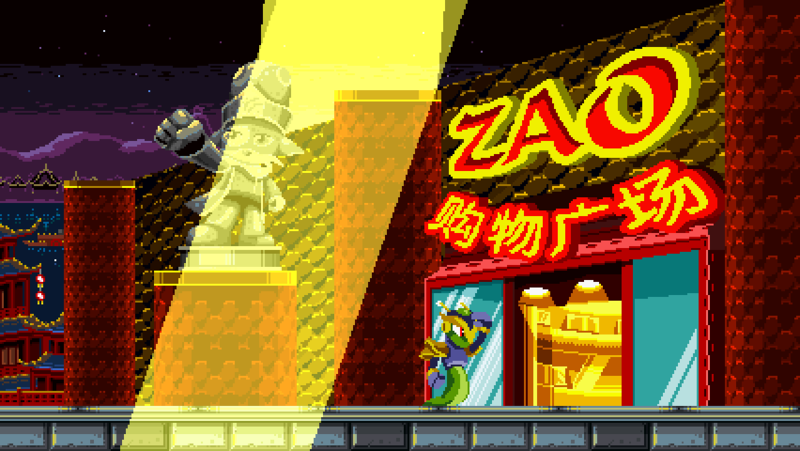 You take something mundane, like a rotating platform, and give it a unique look, cause it to splash special effects across the screen, and even add extra animations wherein the characters (and by extension, the player) realize how great, or scary, or awe inspiring it is to be where they are. Fortune Night is a level that succeeds at all of this, and it does it so well that when you go back and play the tamer levels, like Dragon Valley, Relic Maze, and Aqua Tunnel, you come away with a greater appreciation for how they were illustrated as well. Serpentine’s mech is only the most outstanding of the game’s bosses so far. There are actually quite a few bosses and sub-bosses in the game, including but not limited to a giant purple serpent, a mechanical spider, a bird skeleton, a giant claw, a humongous praying mantis, a whopper of an angler fish, a worm in a diving helmet, and a big samurai helmet with a helicopter on its back. I freaking hate this thing. It once broke away the floor so it left an overhang by the exit that I couldn’t jump to. I had to kill myself off and try again. The main levels are so good and contain enough routes and secrets, like hidden power-ups and playing cards to collect, that I didn’t mind replaying them over and over. In time I even stopped being the treasure hoarder I am and went about setting best times in them. If you tire of that though, there are a couple alternatives. Every character can visit Shang Mu Academy, where you have to make your way through eighteen courses and break all the gongs in them as fast as you can. Apparently there’s also a mahjong game you can unlock, which sounds like a nice distraction. I think I used to play that game all the time via the Windows 95 fun pack. With 5 playable characters and 10 levels for each of them though, I think I’ll be spending all of my time with the real meat and potatoes of the game instead. The game should be releasing next year, and I hope it gets all the attention it deserves. It is masterfully crafted, barring a few kinks and nitpicks that grate on me as a classic Sonic veteran, but they may yet be fixed since it’s still in development. Even if they aren’t, I’m still looking at something I know I’m going to enjoy more than any Sonic game that’s been released since Sonic 3 and Knuckles. 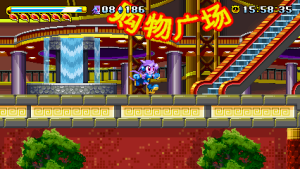 Freedom Planet has a public demo available here. It will be coming to PC via Steam next year. 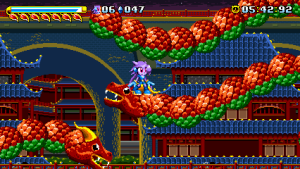 Hey, have you considered joining the Freedom Planet Official forums. I suppose I should, shouldn’t I? How’s the community over there so far? BTW CK20XX: I like your preview its good, but even though you’re a sonic veteran the analyst is pretty dumb and very opinionated ( focusing on the sonic bits than anything else) no offense. I was hoping that you tough up on Freedom Planet’s lore, which you didn’t. 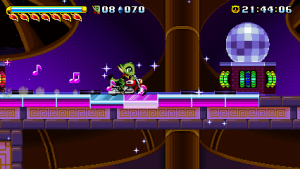 If you think about the legend of Korra, and dynasty warriors then Freedom Planet’s lore is inspired by those series and other stuff. Again I don’t mean to offend you but I strongly urge you not to highlight “sonic” when it come to Freedom Planet anymore THERE ARE other stuff that inspired the creation of this game that you should’ve highlighted. Promoting a strong female protagonist(other than Samus) that aiming for a much larger crowd old and young is not easy, in fact its very hard for the team. Is there really much lore to speak of though? I’ve read some character bios on the official site, but the game is still in development and none of the story elements are in the game proper yet. I can’t comment on what doesn’t exist. In the Press Preview Build, the Sonic elements are probably the most outstanding ones, so it seemed natural to focus on those. I can comment on the rest once the game is actually finished, I expect. 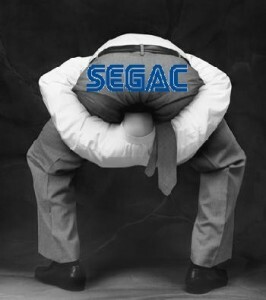 Besides, being a Sonic game is nothing to be ashamed of, just like how being a Mega Man game is nothing Mighty No. 9 should be ashamed of. If you see things in the game that I haven’t yet though, please share! I think I understand what you mean by the Legend of Korra influence since they both have somewhat oriental themes, though it doesn’t seem that strong yet. And I’m not that familiar with Dynasty Warriors, I’m afraid. Wow, I haven’t been on IGN in over a decade. I used to browse it all the time in high school, but when it first became a paid subscription site, I just went and found news elsewhere. I have no idea what’s become of the place now. Occasionally they do something noteworthy, but internet lore seems to suggest that the site’s name is still short for “Idiots Going Nowhere”. I could go make an account and a topic there anyway, just for the game’s sake, but I’d be a brand new user with no clout. Maybe you could recommend a section of the forums to start on? I would recommend the ign pc forums section I think or try the ps4 forms section, IGN has been treading the ps4 a lot on there site. Yeah I have my fare share of displeasure with IGN but there are one of the big cheese when it comes to promoting the games.